Babies are aggravatingly cute, but to the uninitiated, they’re basically aliens. And even the most experienced parent or childcare provider can still be baffled by one of those amazing, screaming bundles of joy. 1. YOU CAN’T GIVE THEM JUST ANY NAME. Many countries prohibit using profanity, numbers, or symbols in children’s names, but some take it even further. Norway won’t allow you to use a traditional last name as a first name. A French court recently ruled that a couple couldn’t name their child after a brand of delicious chocolate-hazelnut spread. Portugal bans parents from naming their child Nirvana. The U.S., however, is more lenient, and will let you name your kid Espn if you really want to. 2. IN SOME PLACES, BABIES ARE VERY RARE. Earlier this year, a baby boy named Pablo became the first child born in Ostano, Italy in almost 30 years. He’s the town’s 85th resident. 3. THEY’VE EVOLVED TO BE ADORABLE. Babies are completely dependent on adults for their survival for the first few years of their lives, so they’ve evolved to maximize the amount of attention they get from their parents and other adult humans. Scientists have pinpointed specific infant characteristics that we find irresistibly cute (known as baby schema), like a large head, round face, large eyes, and protruding cheeks. 4. WE NATURALLY WANT TO SQUEEZE THEM. Yale University research has found that people tend to feel aggressive when confronted with photos of adorable babies and animals. A 2015 study found that having an intensely positive reaction to pictures of babies was linked to wanting to express aggression in ways like cheek-pinching. The researchers aren’t quite sure why this is the case, but hypothesize that it may be a way to regulate extreme positive emotions. 5. EVEN TODDLERS KNOW THEY’RE CUTE. A 2014 study of children as young as 3 years old used baby schema and eye tracking to help understand what babies find most cute. The children could identify baby-like facial characteristics in people, puppies, and kittens. Interestingly, they rated puppies as cuter than other babies or kittens. 6. THEY’RE DRAWN TO SURPRISE. A 2015 study found that babies focus more on objects that surprise them. The researchers found that babies learned more about objects that defied their expectations of the world, such as a ball that seemed to be able to pass magically through a wall. 7. THEY HAVE A UNIQUE REFLEX THAT DISAPPEARS WITH AGE. The Moro reflex, where a baby will suddenly fling out her arms and legs and cry, is an involuntary response to feeling unsupported, but it can also happen as a baby is falling asleep, which is one reasons why swaddling is so useful for babies—it keeps them from waking themselves up with the Moro reflex. The reflex is unique to infants, and by 5 months old, healthy babies grow out of it. 8. THEY ALREADY KNOW TO HOLD THEIR BREATH UNDERWATER. Babies instinctively hold their breath and open their eyes underwater in what’s called the dive reflex. This reflexive response to water decreases over time. 9. THEY REALLY DO LIKE LULLABIES. A 2015 study found that babies remained calm for longer while listening to songs, even in unfamiliar languages, compared to regular speech. 10. THEY’RE WIRED TO IMITATE. Brain activity studies have shown that when babies watch others reach for objects, the motor control regions of their brains activate, too. This helps them understand other people’s actions and think about doing something similar themselves. 11. THEY CAN LEARN IN THE WOMB. Scientists have found that babies can recognize sounds they heard from inside their mother’s womb, such as the theme song to their mom’s favorite soap opera. In 2013, a group of researchers found that infants who had been exposed to a made-up word during the last few months of their mother’s pregnancy recognized the word and variations of its pronunciation later on. 12. THEY CAN’T REALLY SEE. Until they’re around 3 months old, babies can only focus their eyes about 8 to 10 inches away from their faces, though they can see light and movement. They don’t gain depth perception until around 5 months old. 13. THEIR TASTE PREFERENCES CAN DEVELOP BEFORE THEY’RE BORN. While in the womb, babies swallow the amniotic fluid that surrounds them, tasting some of the flavors of the food and drink their mother has had in the process. In one study, babies born to women instructed to drink carrot juice during pregnancy or breast feeding liked carrot-flavored cereal more than babies whose mothers were told to avoid carrots altogether. 14. THEY EAT LESS THAN YOU MIGHT THINK. In the first three months of life, the USDA estimates that babies need between 438 and 572 calories over the course of a day, depending on their size. That’s only a little more than a single Big Mac. 15. THEY HAVE UNIQUE HAIR. While some babies come into this world relatively hairless, others are born with a lot of whitish body hair, especially preemies. This soft, downy fuzz is called lanugo. It develops in the fifth month of pregnancy and if it isn’t gone by the time a baby is born, it usually disappears within a few weeks. 16. THEY STILL NEED PASSPORTS. 17. BABIES CAN GET CREDIT FOR THEIR PARENTS’ MOVIES. Pixar recognizes “production babies” in the credits of its films. Starting with Toy Story, the studio began running lists of the given names of babies born to its employees in the year before a film’s release in the end credits. Now, some video games even list production babies in their credits. 18. IT WAS ONCE CONSIDERED TOTALLY ACCEPTABLE—HEALTHY, EVEN—TO DANGLE THEM OUT THE WINDOW. In the 19th century, people living in dirty urban areas wanted to give their babies access to the restorative properties of fresh air. Without access to backyards and country homes, they came up with a workaround: the baby cage. In the 1920s, inventors came up with compartments that could be propped on window sills in high-rise buildings, effectively dangling enclosed wire cribs outside like air conditioning units. Wonder why that went out of style? 19. THEY CAN DO MATH. 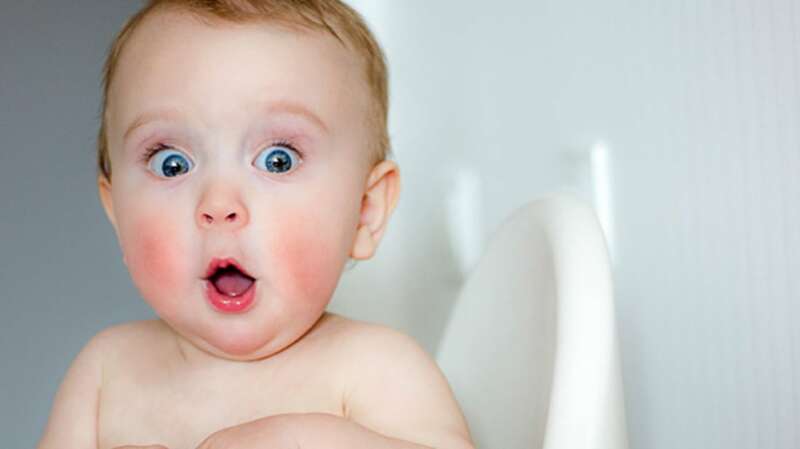 Babies are born with some innate mathematical talents, namely being able to distinguish between orders of magnitude. They can tell the difference between a pattern of 10 dots and 20 dots, for instance. Having a greater intuitive sense of numbers at 6 months old predicted better math scores at 3 years old, according to a 2013 study. Another study found that 6-month-olds can detect math errors when presented with addition and subtraction problems represented by groups of dolls instead of numbers. A 2015 study of 270 families in Philadelphia found that 36 percent of kids had used some kind of touchscreen before they turned 1 year old. While the effect of technology use on kids’ development is still hotly debated, one thing is certain: kids love touchscreens. This is partially due to contingency, the notion that certain events are dependent on others [PDF]. So when a baby pokes at an iPad and makes a video play, she’s exploring contingency, and how her actions can shape the world around her. 21. THEY KNOW THE DIFFERENCE BETWEEN SKYPE AND TV. Because they’re well attuned to social responsiveness (again, contingency) babies can tell the difference between a video chat with their grandparents and being addressed by a static character like Dora the Explorer as part of a television show. This level of tech-savviness can appear as early as 2 to 6 months old. However, they may not understand that Grandma and Grandpa don’t actually live in the computer until later. 22. THEIR HEADS SMELL AMAZING. The smell of a newborn baby has been scientifically proven to be amazing. A study of 30 women sniffing newborns’ pajamas found that the scent increased activity in the brain’s rewards system. 23. THEIR BRAINS HAVE ALMOST AS MANY NEURONS AS AN ADULT’S. A child’s brain changes dramatically over the first years of its life. But the number of neurons stays roughly the same from birth—somewhere between 86 and 100 billion. However, the brain will develop thousands more synapses (connections between neurons) in the first two years after birth. 24. THEY CAN SEE THINGS ADULTS DON’T. Because babies’ eyes aren’t completely developed, 3- and 4-month-old kids don’t have perceptual constancy, or the ability to recognize the same object in different lights, sizes, and colors. But a 2016 study found that babies at that age can see slight differences in images caused by changes in illumination—while adults cannot. 25. THEY GROW UP SO FAST. It’s a cliché, but it’s also true. In the first six months, the average baby grows up to an inch per month, and doubles in weight. By a baby’s first birthday, she’ll have tripled in weight since birth.